On July 1, 2006 the worldwide guinea pig community lost a dear friend: Peter Gurney. 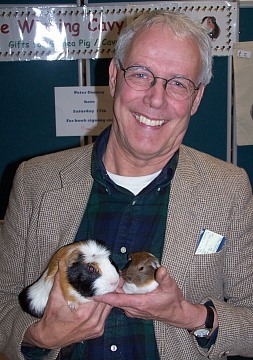 Peter will be remembered as one of – if not the – world’s leading authority on guinea pigs/cavies. His untiring efforts over the years have helped many, many people and their companion animals, and gave us hope for our little ones when we thought there was none. That ceaseless devotion and fiery passion for these dear creatures has resulted in an overall increase in the quality of care and life for our companions over the past two decades. He was a strong voice for the meek, and taught us that just because someone has letters after their name, they might not know what they are doing. He taught us to ask questions, look for answers, and seek other opinions if need be. Being outspoken occasionally landed him in trouble, but no one can deny that his willingness to speak his mind kept many people on their toes trying to keep a half-step ahead of his wrath. The result was more people - professionals and laymen alike - learning more about cavies and how to keep them healthy and happy. Peter leaves a worldwide community of thousands that deeply mourn his passing. He also leaves us a wealth of information and fond memories – not only of him, but of cavy friends that lived with us longer as a result of the better care techniques he taught. His legacy will live on, as we all must continue to strive for the goals he set for better care and humane treatment for our companions. His memory will live on forever in our hearts. Go in peace, dear friend. The Dr Hadwen Trust is a registered charity dedicated to finding alternatives to the use of animal experiments. GOSH is where Peter would take piggies to visit and cheer the sick children.